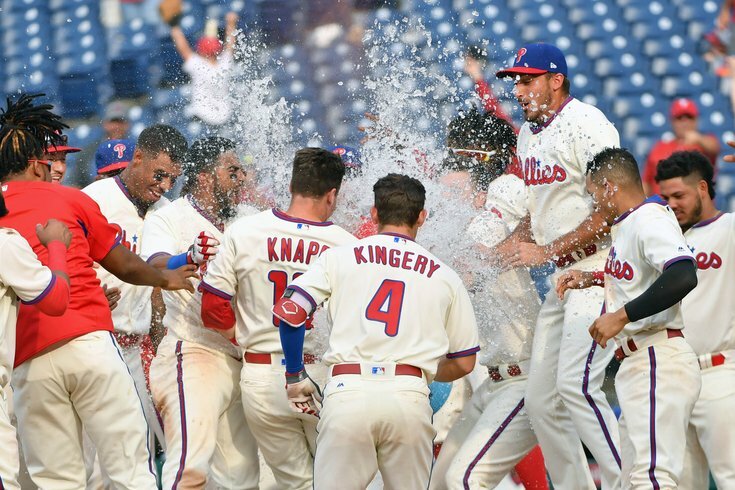 The Philadelphia Phillies celebrate after their 13-inning win over the Washington Nationals at Citizens Bank Park on Sunday. The Phillies are preparing to host the Orioles and (future Phillie?) Manny Machado over the Fourth of July mid-week holiday, and while a lot of talk will revolve around the team's widely reported interest in Baltimore's third baseman, it's worth taking note of the fact that the Phils, even without Machdo, are actually pretty decent. Winners of five of their last six series — the lone loss came at the hands of the Yankees, arguably the best team in baseball — after taking three of four from the Nationals over the weekend, the Phillies are very much in the mix as the 2018 MLB season hits its midpoint. Entering play on Tuesday, the Phillies are 45-37, a game ahead of the Dodgers for the National League's second wild card spot and three and a half games behind the Braves for the NL East. Almost as important is that with their series win over the Nats, the Phils put more distance between themselves and Washington, who is now seven games out of the division lead and three and half behind Philly. Oh, and if you're wondering about the Mets and Marlins, you can stop — they're 15 and 15.5 games back, respectively. In other words, the NL East is a now a three-team race. And it's in danger of becoming a two-team race as the Nationals still have two more games against the Red Sox before their schedule gets significantly easier heading into the All-Star break. That being said, the Phillies are also coming out what many expected to be the toughest stretch of their season and, aside from a couple of inter-league games, will be playing the same three teams as the Cats prior to the break — Pittsburgh, Miami and the New York Mets. So, with half the season in the books, where do the upstart Phillies stand compared to the best baseball has to offer? Now seems like as good a time as any to check in on another edition of NBA power rankings roundup. Matt Snyder 10 (+1) They've now won five of their last six series, with the lone series loss coming to the Yankees. Gabe Lacques 11 (--) Now 6-1 in extra innings after 13-inning conquest of Nationals. Emma Baccallieri N/A (--) The Phillies have been hovering a few games back of first place for weeks now, but they have a chance to make a serious run leading into the All-Star break. It would be hard to ask for a better schedule than their upcoming slate of games against the Orioles, Mets, Marlins and Pirates. Bobby Mueller 14 (+2) If the season ended today, the Phillies would be the second wild card team in the NL. They’re doing this despite getting very little from the shortstop position. If any team could use Manny Machado, it’s the City of Brotherly Love.